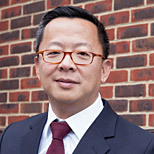 Professor Raymond Lee is Dean of our School of Applied Sciences and holds a Chair in Biomechanics in London South Bank University. He won the British Council Fellowship to complete his PhD degree in Bioengineering at the University of Strathclyde, Glasgow. He was also awarded the Association of Commonwealth Universities Development Fellowship, which supported his research work at King’s College London. As the Dean of the School of Applied Sciences, Professor Lee is committed to provide leadership to establish the School as an internationally recognised centre of academic excellence. He is keen to transfer new knowledge created through research into teaching and enterprise activities. He brings substantial international experience with previous roles at the University of Sydney and Hong Kong Polytechnic University, and has been involved in e-learning development throughout his career. Externally, he has been invited to act as referee for national and international research funding bodies. He has served as member of the Research Sub-Committee of Arthritis Research UK, and a research grant panel member of Fundação para a Ciência e a Tecnologia, Portugal. Prof. Lee’s main research areas lie in biomechanics of the spine, kinematics and dynamics of human motions. His research work has examined the biomechanical mechanisms underlying back pain, osteoporosis and ageing of the spine. He has made innovative use of miniature inertial sensors in a broad range of projects, including the assessment and monitoring of human motions, spine posture, mechanical signal transmission in the body, falls in the elderly and level of physical activity. He is particularly interested to study how physical activity and exercise affect musculoskeletal health, the risk of vertebral fractures, and the quality of life.